You would think a tomato's color would tell you something about its taste. Well, it does! No matter what wacky, newly cultivated tomato varieties you find at the market, you can use their color to predict their flavor profile. Find out what flavors to expect from classic red, deep purple, bright green, and even almost eerily white tomatoes. No matter what color the tomatoes you're considering are, choose tomatoes that feel heavy for their size and smell, if but faintly, of tomatoes. Red and pink tomatoes offer up what most of us think of as a classic or standard tomato flavor: acid and sweetness in balance. Perfectly ripe heirloom tomato varietals are best sliced and raw, especially the softer and fruitier ones. If you find yourself with firmer, denser red tomatoes, those are the kinds that are particularly well-suited for being turned into sauce or otherwise being preserved. They're called purple and black tomatoes, but most of them are more of a maroon or purple-y brown color, like the Cherokee Purples pictured here. These tomatoes tend to have an earthy, almost smoky sweetness to them, with a bit less acid than red tomatoes. Their pretty color doesn't survive all that well when you cook them—turning a drabber version of whatever they start out as, so these are best used raw in salads and salsas for dramatic effect. Orange and lemon tomatoes, like Lemon Boys and Flamme Oranges, are mild, sweet, and have very low acid. They are the varieties that will most remind you that tomatoes are, botanically speaking, fruits. Their low acid keeps them from being the best candidates for cooking or preserving but makes them perfect for salads and other raw treatments like bruschetta—just toast some bread, rub it with garlic, brush it with olive oil, pile on some chopped tomatoes, sprinkle with salt, and bite into summer. All tomatoes start off green, of course, and there are ways to harvest and make use of those under-ripe tomatoes if they're still on the vine when frost threatens, but some varieties, like the Green Zebras (pictured here) and German Greens, are green even after they're ripe and sweet and ready to eat. These truly and deeply and forever green tomatoes tend to be less acidic than red tomatoes, with a balanced sweet-tart flavor. They're perfect in salads, adding a tomato kick while keeping things all-green. White tomatoes aren't really white. They're more of an extremely pale yellow or fabulously delicate green, as you can see above. Like yellow tomatoes, white tomatoes, such as White Beauties, are noticeably less acidic than red tomatoes. 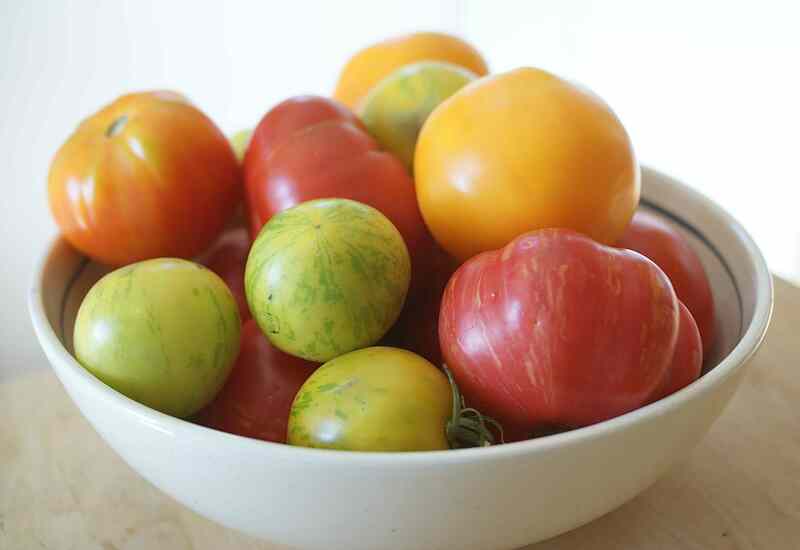 They are also the sweetest varieties (even sweeter than orange and yellow tomatoes). The lack of acid makes them not the best for cooking into anything, but they are simply lovely sliced, salted, and served as simple as can be.